Salam hari jumaat yang berkat.. This request has been sent thru my email long time ago *time preggy dulu2 and few comments from my previous entry about breastfeeding, asking why I'm using AVENT VIA cup as ebm storage.Here we go, let me try to review n explain in detail why I'm choosing this type of storage cup. After all, whatever type of storage we use, does not the big issue. As long as we committed to breastfeed our kid, that will be more than enough. It really depend on your storage capability actually and ikut keselesaan mommy jgak. * pernah jumpa blog ibu yg simpan ebm dlm plastik ais krim. 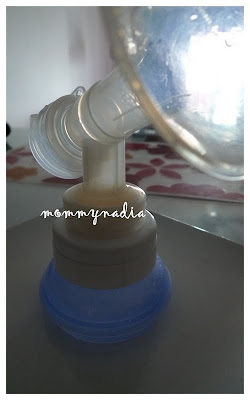 So the review below, is how this cup really make my life easier and make breast pumping is a smooth journey! Yes, this really a big matter for me specially when we have to bring alot of things to the office everyday. Lucky that I dont have to carry cooler bag everyday,since office pantry ada peti sejuk.Masa awal2 keje dulu, ke hulur hilir angkut spectra bag, smp guard pun tegur balik kg ke? Lepas dah few months, decided to leave the pump at office. Back to how this big size cup can really save the space of my bag. Normally I pumped around 20-22 oz which equivalent to 2 x 8oz and 1x 6oz via cup. So, if I'm using the 5oz bottle, I need around 4-5 bottles to the office daily. And the best things, this cup can be stacked so that it can fit well into my bekas with others shield and adapter. So everyday, I just need to bring this to the office! Haha, this is the most best part of using this thing. I can continue pumping at 14oz without need to stop at every 5oz. How?? Before that, let me tell ya. To use the AVENT via cup with medela or spectra pump,or even AVENT pump itself, I have to use with AVENT adapter as picture below. 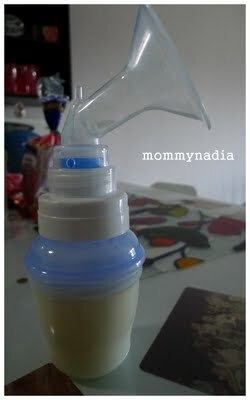 with Mini E or medela shield.. I just continue pumping exactly at the level of the membrane inside. Then, I will just need to transfer to the other cup around 5-6oz. Compare using the 5oz bottle, if u are using miniE or spectra3, need to ensure ebm tak lebih membrane tu * normally at exact 5oz kena stop ,sb takut nanti expressed milk boleh masuk ke dalam pump. Ini yang diberitahu oleh pekerja dekat medela service aritu. So that, leceh lah bila time pump katoffice, every 5oz kena change bottle. or spectra shield, seperti ini.. Besides of saving space at my daily pumping bag, storage dalam freezer pun boleh jimat banyak ruang. 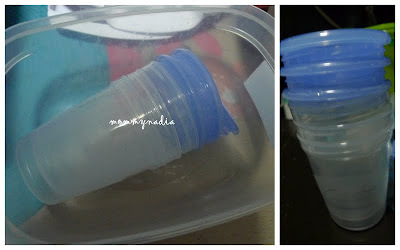 By using this cup, either using fridge or freezer, I can save space by stacking up the bottles as per picture down here. Stacked at upper freezer, or u can check here to see how I stacked in my upright freezer. 3. Use as food container. I have been using this cup since Adam's time. After many cycle of cleaning and sterilizing, I used this cup to store Adam's porridge for nursery. So instead of throwing, this cup can be recycled for other usage such container purpose. 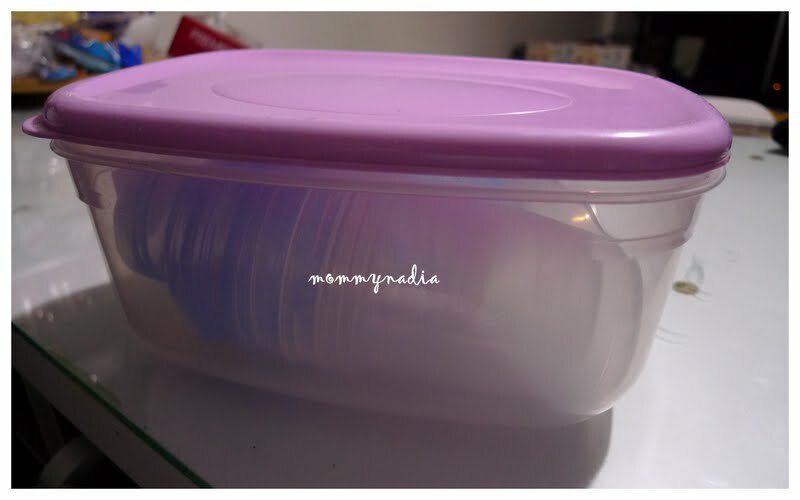 Many asking why I like to use this type of storage, nmpk besar and will surely use a lot of space. Again, u may used any type of storage to store the ebm as long as its convenient for u and you are comfortable using it, considering many factors too. 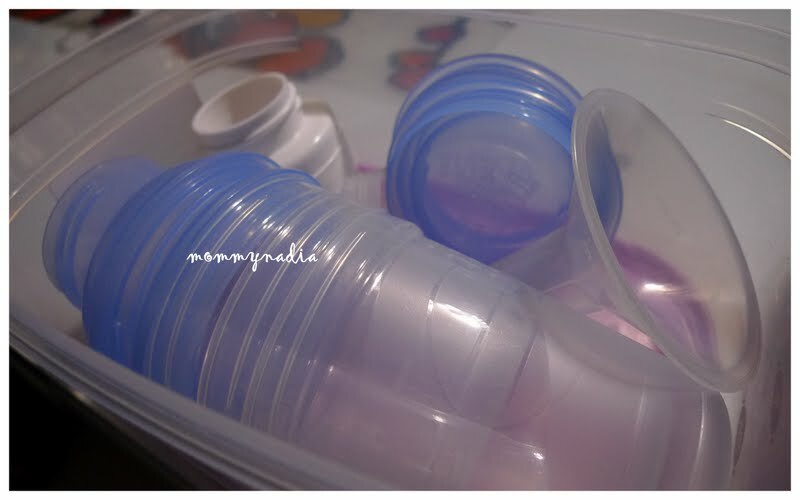 Even, I also not into using bag to store the ebm as I really dont have time to transfer to bottle for nursery use every morning. Direct thawing is not good too and as of now only few type of storage bag that is BPA free. Kalau BPA free plak mesti mahal. Huih 1 time use then throw, botak ler..;(. 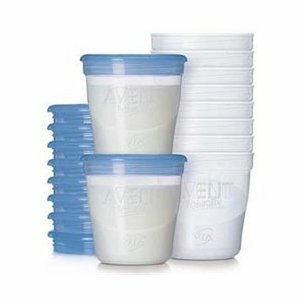 Yeap, for price concerned, AVENT VIA cup a lil bit expensive, just slightly lower than medela storage system,but yet,I always bought during sale. Mase sale up to 20% less, time tu borong habis2. So far pun I baru ada dalam 80 bottles of this AVENT via cup je. 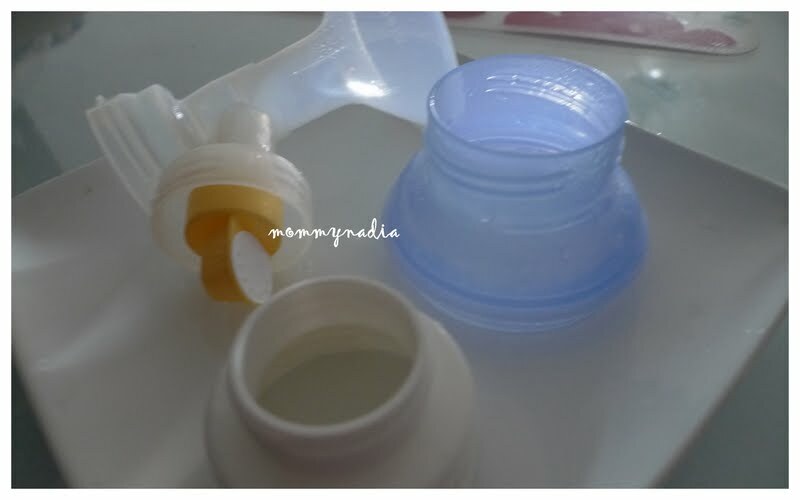 In fact from my bottles collection pun, I still have collection that I mixed with bumblebee, moms lil one,spectra and medela bottle. Specially bumblebee, sgt murah kan, so I still beli jgak, and true bnyk jimat space too. Ada pro n cons. Again, this is my two cents. Reviewing what I'm using right now and hopefully helping those who still finding info about this. But if u ask me, I will say, I'm fully satisfied and will continue using it. InsyaAllah. hi deat thkns for sharing. cup ni berapa oz yer satu? ada 6oz and 8oz..ilove 8oz nye! aa baru nak tanye brape oz coz nampak dlm pic yg 2ndlast tu ada 2 sizes. i pun mcm nak beli jugak coz botol2 semua dah habis. now using liner tapi leceh huhu.. wow banyaknye u ada 80 cups! best2 :D i pun nk beli bila ada discount nnt hehe..
porridge tu I masuk fridge tp bahagian atas- freezer. Time tu tkde upright freezer lg. terima kasih.salam ramadhan utk ct n family too! 80 tu pun total up dr Adam punye lagik. 20plus dah diasingka utkfood container. I lagilah tak reti langsung pakai liner tu! I selalu beli kat parkson,or babayjaya aritu pun sale best!beli satu pek yg 10x8oz and 10x6oz around RM90++..
Waaaa...syioknye tgk stok susu u!! So inspiring!! satu session pumping brapa oz u dapat ek? And at office brapa pumping session? 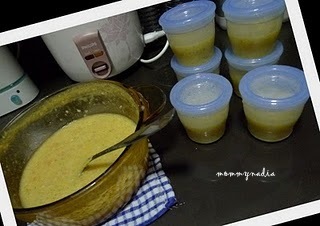 my stock slalu cukup2 mkn je...heheeee..
Slamat puasa to u n family!! 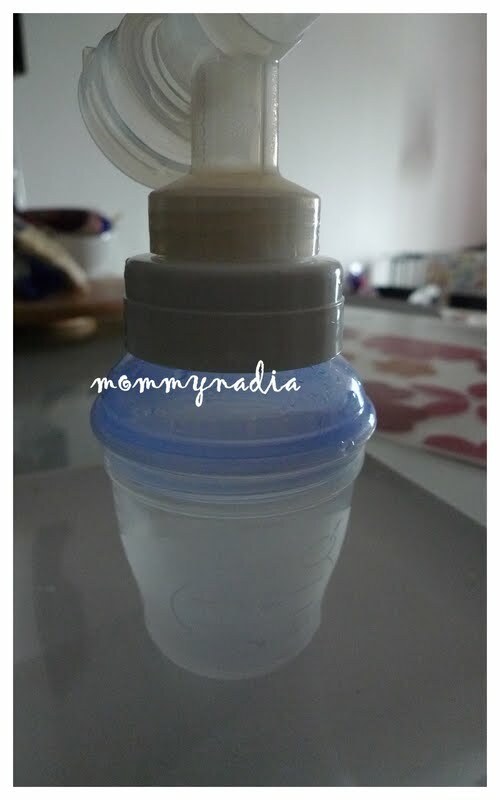 tu stock time pantang,skrg pun ada kurang sket,sb time constrained.try to pump 3times,tp managed to pump 2 times aje.depend,kdg2 boleh dapat 18-20oz sometimes up to25oz. Tp actually susu kita pump sama dgn qty baby consumed at nursery. Bln puasa ni mencabar jgak,i tak amik any supplement, a lil bit merudum,tengah figure out what to do,nanti InsyaAllah I share,hopefully tak terlmbt! 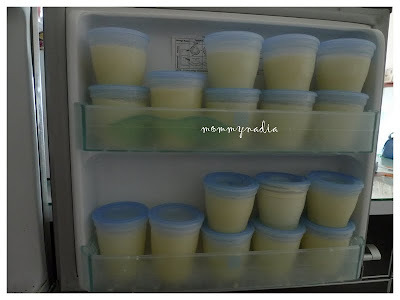 Selamat berpuasa to u too dear,sama2 kita ensure stock susu kita maintain ek! WW : Adryan new skill! Kizsports & Gym The Empire..
Sinar Ramadhan Al-Mubarak bersama mothercare..